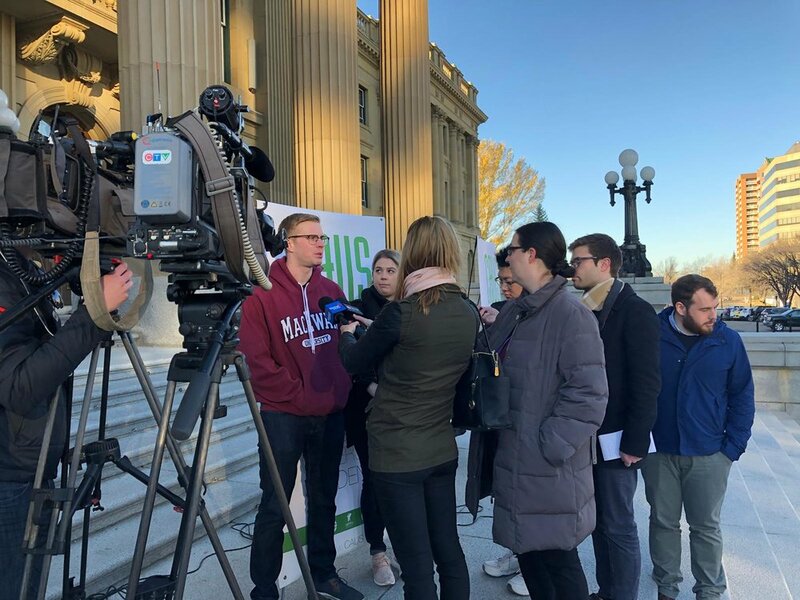 This morning, we held a press conference on the steps of the Alberta Legislature Building to speak about why we cannot wait to address issues of accessibility and affordability any longer. You can view a live recording here. Thank you all for being here today. My name is Andrew Bieman and I am the VP External of the Students’ Association of MacEwan University and the Chair of the Council of Alberta University Students. I am joined here today by my colleague, Amanda Leblanc, who is the Vice Chair of CAUS, and the Vice President External for the Students’ Association of Mount Royal University. Our organization represents over 100, 000 undergraduate students from universities across Alberta, including Macewan University, Mount Royal University, the University of Calgary, University of Lethbridge, and the University of Alberta. We called this press conference today to serve as a summation of our Tuition Forecast campaign that ran over the past two months across all of these campuses. As you are aware, a tuition freeze was first implemented for the 2015-2016 academic year with the promise that the Government would engage in a comprehensive review of the post-secondary sector, including specific evaluation of the tuition model and ancillary fee regulation that was taken out of legislation over a decade ago. Since regulation of tuition has been removed from the Post-Secondary Learning Act, students have experienced significant increases to their tuition and it has had a detrimental impact on the already heavy financial burden associated with post-secondary education in this province. Unfortunately, Alberta already has one of the lowest post-secondary participation rates, and data shows us that financial barriers continue to be one of the most concerning to students across the country. Without taking steps to ensure that post-secondary education remains affordable, we are facing incredible economic, social, and competitive losses for the future of our province. CAUS has continually advocated for a long-term, predictable, and sustainable tuition model - tying all future increases to the consumer price index, closing loopholes and stricter regulation models for ancillary fees, and making post-secondary education as affordable as possible for students no matter what their circumstances are. We have participated in countless consultations and advisory groups, gathered evidence and research to support our asks, and continue to work on behalf of students to make education an accessible reality. While we are thankful that the government implemented a tuition freeze during their review, we truly believe that a continued tuition freeze is a band-aid solution that will result in negative outcomes for students if a long-term solution is not presented prior to the end of the freeze. Provinces like Saskatchewan and BC have seen increases of up to 30%, having the opposite effect of such intentions. We have been cautiously optimistic and eagerly awaiting news on this matter, but we realize that movement must happen sooner than later. If not, we will see enrolment rates decrease, marginalized communities face even more barriers, and provinces with more competitive environments become more appealing to prospective students, forcing Alberta to lose its future work force and the development of its knowledge economy. At the eve of the legislative session, over 1500 students across this province have participated in our campaign to ensure that the Government realizes the urgency in addressing their needs. Once again, thank you for joining us here today. I will now invite our Vice Chair Amanda Leblanc to share her comments and speak more about our campaign. I’m very thankful to be here today and speak on behalf of our member organizations. Over the past two months, hundreds of students from our five member institutions have taken the time to share their experiences with us and use their voice to amplify our campaign. We have hundreds of hand-written letters, emails, and signatures addressed to the Minister of Advanced Education, Marlin Schmidt, contextualizing how making tuition more affordable would personally impact them. We have stories from mature students who have returned back to school to upgrade or supplement their education, students who are single parents and how a more affordable education translates into stable childcare and more quality time with their families. We have stories from students who were the first to ever attend post-secondary in their families, and having a more affordable and predictable tuition model will mean the difference between the financial stability to complete their education, or having to question whether they can afford to come back for another year. We have students who have told us that a few more dollars in their pockets has meant not having to choose between fees or food. We have students that want to contribute to their communities in amazing ways, but cannot participate because they have to work long hours on top of a full-time courseload in order to afford school. We have international students who have chosen our province because of the quality of our educational experience, yet can barely afford their basic needs because of how expensive their tuition becomes year after year. Without regulation, we see our peers having to decide between living in extremely difficult circumstances or having to leave without completing their education. If we truly believe in the intrinsic value of the diversity these students offer our community, then we must act in a way that truly demonstrates our support. These stories belong to real people. Real Albertans from a diversity of socioeconomic backgrounds, who all deserve the chance to access post-secondary education. Over the past few months, members of our organization have spent countless hours tabling in hallways and collecting these stories. As unique as each of their circumstances are, a common thread is present: that having a predictable, long-term, and sustainable model for tuition and fees in Alberta will vastly improve their lives. With us today, we have hundreds of personally signed letters that we plan to personally deliver to the Minister’s office. This is in addition to the hundreds of emails that have already been sent to him directly. We’ve taken this opportunity to physically demonstrate the collective effort from our students and hope that it encourages the government to act. As Andrew has said, there is an urgency in addressing this issue. Students do not support yet another extension of a tuition freeze, as we know that it will end up hurting students without a long-term alternative. We hope to see this upcoming legislative session include action that amends the Post-Secondary Learning Act to include the regulation of tuition increases, better regulation and transparency for ancillary fees, and will continue to support students with long-term solutions.